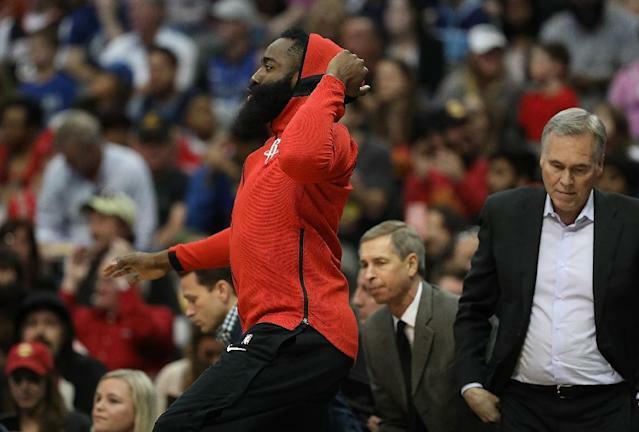 Los Angeles (AFP) - The Houston Rockets clinched an NBA playoff berth with a 105-82 rout of the Mavericks in Dallas on Sunday as reigning champions Golden State and the Cleveland Cavaliers both lost. Even with Most Valuable Player candidate James Harden sitting out with a sore left knee, the Rockets had little trouble from the Mavs. Only a spate of eight second-quarter turnovers by Houston helped Dallas erase a 15-point deficit and briefly take a six-point lead. The Rockets soon tidied things up to take a one-point lead at halftime that they wouldn't surrender after the break. Point guard Chris Paul scored 24 points and handed out 12 assists and guard Eric Gordon added 26 points for the Rockets, who led by as many as 26 in the fourth quarter. Houston, who saw their 17-game winning streak ended by Eastern Conference leaders Toronto on Friday, improved their league-best record to 52-14. They're 1 1/2 games ahead of the Warriors atop the West and Gordon said the Rockets would keep the accelerator down in a bid to claim the top seed. "We want to finish number one -- I think that's the main goal," he said. The depleted Warriors fell 109-103 to the Minnesota Timberwolves, the defending champs' second straight defeat. With superstar Stephen Curry missing a second straight game with a sprained right ankle, Kevin Durant scored 39 points and pulled down 12 rebounds for Golden State. But Durant connected on just 11 of 32 of his shots from the field and sharp-shooter Klay Thompson needed 22 shots to score 21 points. Draymond Green contributed 10 points, eight rebounds and seven assists for the Warriors, who were also missing Andre Iguodala, David West, Patrick McCaw and Jordan Bell as they lost back-to-back games for only the second time this season. "We're just in a bit of a tough stretch," Warriors coach Steve Kerr said. "I'm really pleased with the effort. We'll get some guys back here hopefully in the next week or two, and I'm very confident with where we're heading." 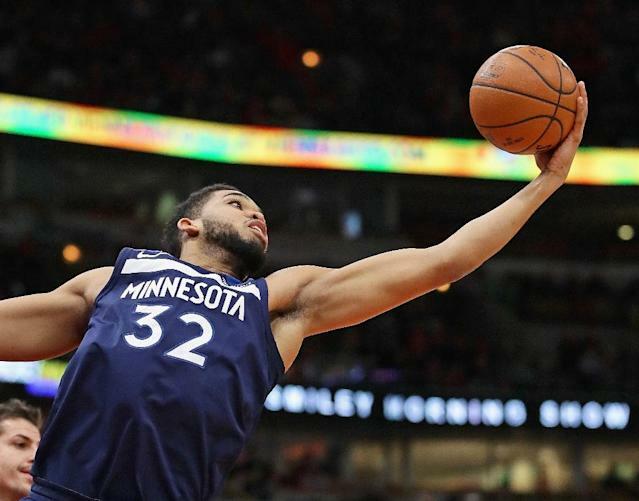 Karl-Anthony Towns was a force inside for the Timberwolves, finishing with 31 points and 16 rebounds. Although the Warriors were far from full-strength, Minnesota's Andrew Wiggins said it was an important win. "This is big for us, because this is one of the best teams in the league, if not the best," Minnesota's Andrew Wiggins said. The struggles continued for the Cleveland Cavaliers, who fell to the Warriors in last year's finals after beating them the year before. LeBron James and the Cavs tied it twice but never led in the second half in a 127-113 loss to the Lakers in Los Angeles. Lakers point guard Isaiah Thomas, acquired from Cleveland in a trade-deadline deal, scored 20 points. 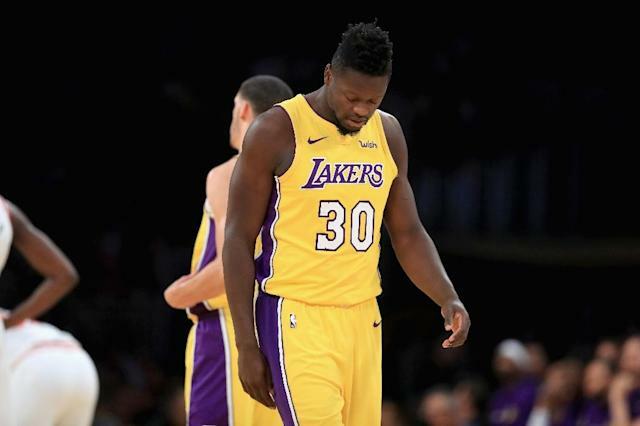 Los Angeles forward Julius Randle poured in a career-high 36 points and pulled down 14 rebounds. The Lakers' performance offered James a glimpse of the young talent he could align himself with should he opt to move to Los Angeles as a free agent next season. The Lakers, with money to spend under the salary cap, have been touted as one possible destination for James, although he's said he's only focused on getting Cleveland back to the finals this season. James scored 24 points with 10 rebounds and seven assists, but the Cavs lost for the fourth time in six games. They're fourth in the Eastern Conference, half a game behind third-placed Indiana who edged second-placed Boston 99-97. Eastern Conference leaders Toronto cruised past the New York Knicks 132-106. The Celtics, playing without ailing Al Horford and concussed Jaylen Brown, squandered a 50-40 halftime lead in their narrow loss to the Pacers and saw Kyrie Irving depart in the second half with a sore left knee. In New Orleans, Ricky Rubio scored 30 points with 10 rebounds and seven assists as his Utah Jazz withstood a triple-double from Anthony Davis in a 116-99 victory over the Pelicans. Davis had 25 points, 11 rebounds and a stellar 10 blocked shots in his return from a one-game injury absence, but he had no win to celebrate on his 25th birthday.